As many of you know, Will loves Nintendo. Like LOVES it. For those of you that have a little gamer in your house, I wanted to give you a some insight on the new Nintendo releases coming out November 21 and activities you can participate in around Canada. Here’s all you need to know about Nintendo Day. November 21st, 2014 is a huge day for Nintendo fans across Canada as Nintendo will finally be releasing some the most anticipated games of the season: Super Smash Bros. for Wii U, and Pokémon Omega Ruby and Pokémon Alpha Sapphire on Nintendo 3DS. Also available that day for the first time ever will be the all-new amiibo, interactive figures that are compatible with several Wii U titles. The initial amiibos will include Mario, Princess Peach, Link, Pikachu, and more. Will and I were honoured to be invited to a few Nintendo events this month where we got to test out the new games and additional Christmas releases. Here in Will’s order of preference are his and my thoughts on the new games. 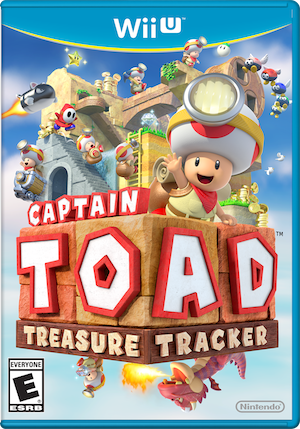 Being released on December 5, 2014, Will at the age of 6 was immediately drawn to Captain Toad: Treasure Tracker. Frankly, I was too. It’s about time Toad got out of Mario and Luigi’s shadow and got his own gig. The game starts when Toad and his girlfriend Toadette are out on an adventure and a large bird steals not only Toad’s shiny power star but Toadette. Toad is the only one that can save her. Each level of the game is a new mini-universe where Toad has to solve a maze to get to the power star at the end. In total, there are more than 70 mini-universe stages. The technology in this game is really fun and you can move the Wii U game pad to see the maze from all sorts of different angles. From on top, you can easily see where Toad needs to go but from another angle you can find coins and treasures. I literally had to drag Will away from this game so others could try it. Toad himself is adorable. His bag is heavy so he can’t jump. He has no super powers. He is just a mushroom on a mission. Instead of weapons, he is equipped with the ability to throw turnips at enemies. This is the kind of game I want my kids playing. The bad guys are mostly enemies form Super Mario including shy guys and piranha plants. Nothing that will scare young children. The game will retail in Canada for $44.99 and is great for kids and any other gamer that loves solving puzzles and mazes. The game is rated E for Everyone. This is a game that as a mother I don’t understand. Will on the other hand is all over it as I assume most kids will be. In my mind, the game is chaotic and a little pointless. Still I watched a lot of grown men and younger boys and girls line up to attempt this game with 8 players at once. Super Smash Bros unites a group of Nintendo greats from Mario, Pikachu and Donkey Kong all the way to Pac Mac and even Miis in an onscreen battle. Each level in the game is a stage and the point is to win the battle against the other players by sending them off the stage. Each character has a variety of strengths and weaknesses which make the battles more interesting. 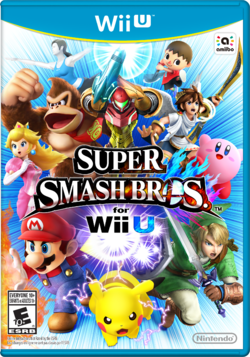 Super Smash Bros for Wii U will be released November 21, 2014. The game will retail in Canada for $64.99. The game is rated E for Everyone 10+. From what I can tell, the rating is based on the cartoon violence and not difficultly. Will was easily able to play this game and really enjoyed it. I watched several rounds of it and although there is some violence it is very cartoon violence. There is no blood. 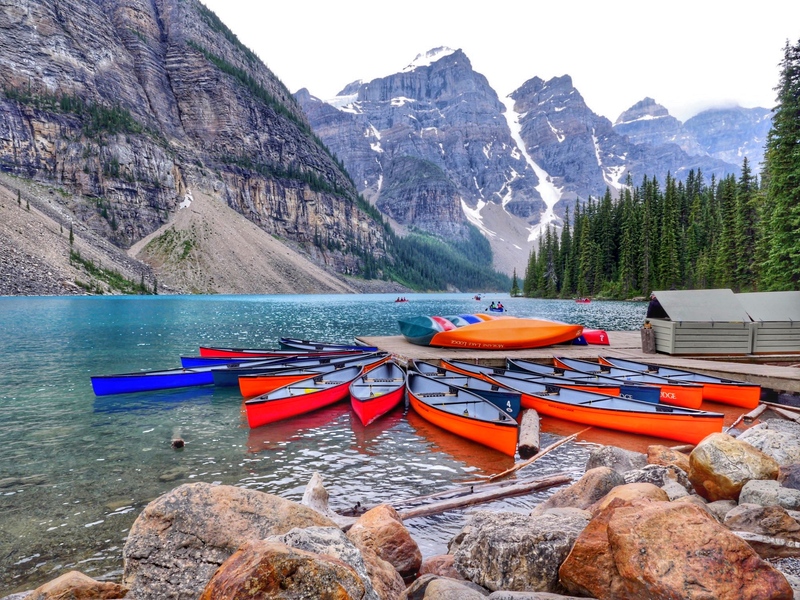 When you are defeated you are simply thrown from the arena to return seconds later. It is not a game I would be uncomfortable with Will playing. At first sight, Amiibos look sort of like Skylanders. I quickly discovered they are in fact very different. 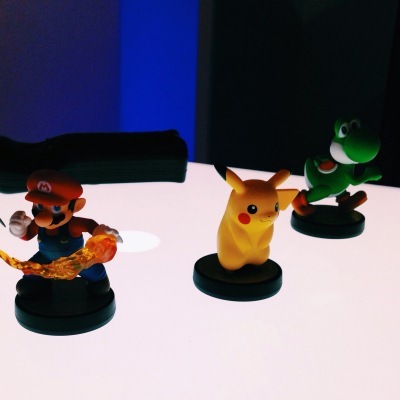 The Amiibos we got to try were Mario, Yoshi, Link and Pikachu. Each were adorable in their own right. Will considered them more cool than cute. Each will retail in Canada for $13.99 and they do not require a portal like the Skylanders do. So what is an Amiibo? They are small plastic characters with a base that connects them to your Wii U. With a quick swipe, each Amiibo can enter games like Super Smash Bros and my favourite Mario Kart 8. The interesting part is that they don’t enter games fully equipped. Instead, each Amiibo enters not knowing anything. It is up to the player to train the Amiibo to play along side the player. When an Amiibo enters the game, the player is not the Amiibo character. The Amiibo plays along side on its own. The more the Amiibo plays it will learn the style of the player and be trained in that way. Once your Amiibo is ready, it can enter Super Smash Bros matches and Mario Kart races to see whose Amiibo is the strongest. Whether or not your kids love this game, you probably will. NES Remix Pack is a mix of old Nintendo games including the original Super Mario Games, Dr Mario, Donkey Kong and more. You compete in levels where as you progress through them trying to beat a timer the screen changes to do things like blur the screen. This game isn’t easy but its a lot of fun. I relived my gamer past trying to defeat levels of games I knew like the back of my hand. Will was really into it too and it was a fun game to tackle together. NES remix will be released December 5, 2014 which is not soon enough for me. The game will retail for $34.99 in Canada and is rated E for Everyone. I’m hoping to be the lucky one that finds NES Remix in my stocking this year. A few other games have already been released for Chrismtas including Just Dance 2015. This game has always been a favourite for most people. But watch the video below and don’t say I didn’t warn you. Other games recently released for Christmas include Bayonetta 2 (not for kids), Mario Kart 8, and of course Pokemon Omega Ruby and Alpha Sapphire which are being released on Nintendo Day, November 21, 2014. What is Santa bringing for your little Gamer? 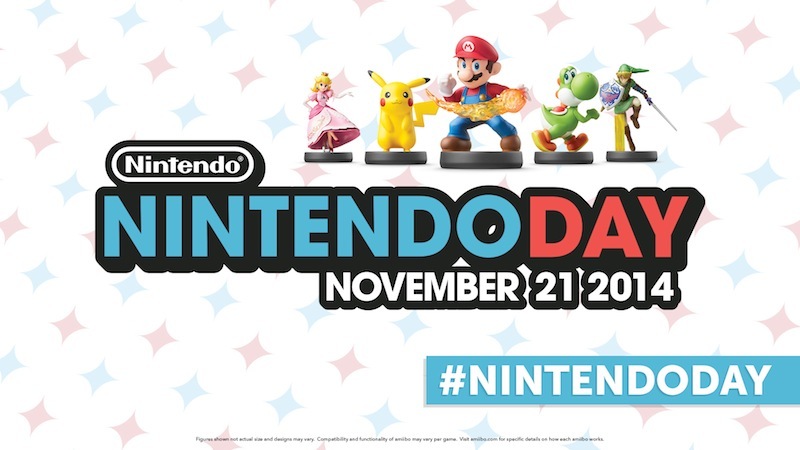 Hope to see you all on Nintendo Day! i just went out and purchased the Wii u 32G Super Mario 3D world deluxe set. Thanks for all the info Sarah. I think my son is going to love his Christmas gift.